Prior to beginning our partnership with Lorain County in 2013, God was preparing our work through fostering a couple of key connections. Some of you may know the story of our start in this community (the full story is for a different post, perhaps) but for those of you who don’t, it began with the perseverance of one of our trip leaders. A Youth Leader from Ohio had taken a group to the Bahamas for their own mission trip and before we knew it, we were preparing to set up camp at their home church for a summer of service in Lorain County. Part of preparing any site is going through the process of focusing in on the type of work our volunteers will participate in during their trip. The can be tied to a specific community initiative, church outreach, community leader or community organization. For us, in Lorain County, this is where we began our relationship with Neighborhood Alliance. 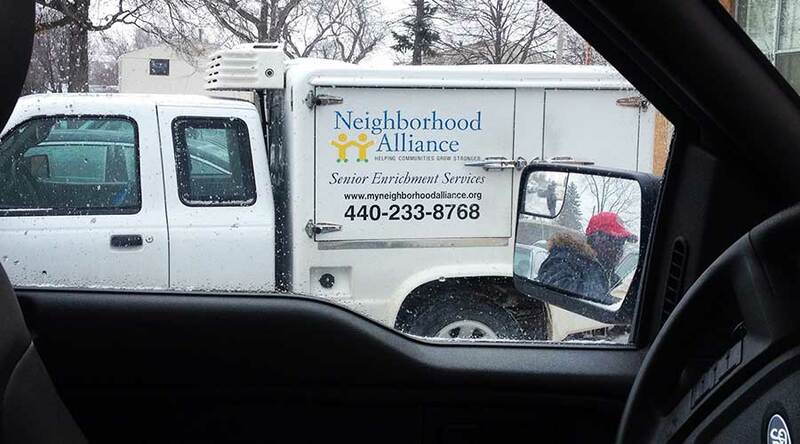 Neighborhood Alliance has been compassionately caring for Lorain County since 1927. They work with clients from all different demographics providing emergency shelter, family support services, child care and enrichment services, access to wellness programs, as well as daily hot meals to homebound seniors. With their commitment to being accessible to their clients, they have locations placed right within the neighborhoods they serve throughout the county. Neighborhood Alliance prides themselves on utilizing a collaborative approach to serve the community. It is important to them to work in tandem with other like-mission organizations to deliver services whenever possible to ultimately enhance comprehensive services to residents of Lorain County. After swapping missions, it was a no – brainer. Whatever Neighborhood Alliance was leading, we wanted to be a part of it. Neighborhood Alliance saw a clear fit for us in working with their Senior Meal Delivery Program. They had expressed a gap in their capacity with seniors when it came to things like home repair, sharing that often times when delivery drivers were exposed to a physical need on the home, they would have nowhere to turn. Since 2013 we have been working alongside this amazing organization. It is a joy to be a part of the important and meaningful work they are doing in Lorain County and a comfort to know that the homeowners we encounter have a organization like Neighborhood Alliance to support them before and long after our time with them.